As you may know, education spending in the United States is chronically low, totaling six percent of the total federal funding per year. 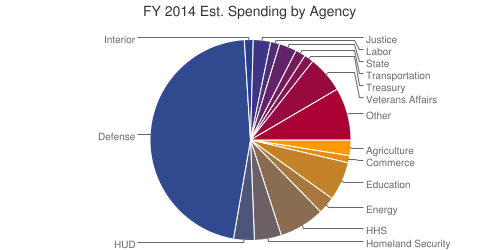 According to the U.S. Department of Education, the primary source of funding in the U.S. is intended to be from states and localities (approximately 83 cents per dollar, as of the 2004-2005 school year). The issue with this is the high rate of income inequality in the United States, particularly by location (rural, suburban, or urban). As such, those who live in poorer areas are able to contribute less to students’ education, and school funding, as well as educational quality, suffer. Lack of funding in schools and school districts often coincides with low rates of educational attainment and high rates of school closures (leading to overcrowding and high dropout rates). These issues correlate with higher rates of imprisonment, lending to the “school-to-prison pipeline” that academics and activists have become aware of. Since funding of schools is intended to be mostly by locality, it is valuable to assess how poverty rates in different localities might indicate a link between school resource allocation and the school-to-prison pipeline. Without accounting for locality, the average elementary and secondary education funding by local sources is approximately 44% (as of 2011). When taking locality and poverty rates into account using the same data set, there is a clear trend in the allocation of local funding versus total funding (which includes federal, state, and local funding). 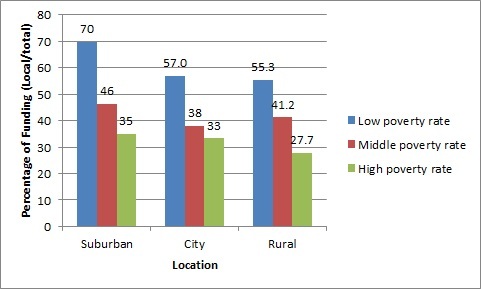 In areas of low poverty, all localities are able to contribute more to schooling, High poverty rates in all localities produce the opposite effect, as one might expect. Interestingly, suburbs and cities with high poverty rates are able to contribute roughly the same percentage to funding, while rural localities are able to contribute a lower percentage to school funding. Schools that are funded less by the community receive less funding overall and also enjoy less community engagement with the schools and student education. Student educational attainment is lessened by these factors and research shows higher rates of arrest and incarceration among those with lower educational attainment. These findings suggest that school resource allocation does not consist of a single number across the board, or a certain number of cents out of a dollar. One must take into account locality and poverty rate in determining school funding and understanding how the method of funding schools in the United States privileges certain students over others, creating educational opportunities for some and all but ensuring criminal records for others. 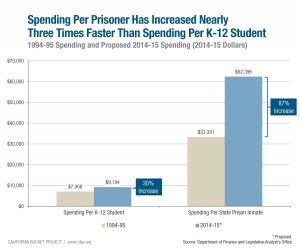 Additionally, funding for prisoners is increasing at a much higher rate than funding for students — nearly three times as quickly. Coupled with the chronic rise in America’s prison population, funding priority at federal and state levels seems to be given to prisons rather than schools. This results in resource-strapped schools, particularly in areas that are already limited in funding (i.e. poor locations, cities, and rural areas). Through this funding structure, students continue to be shuttled through the school-to-prison pipeline from schools to prisons, perpetuating the funding cycle and the pipeline. 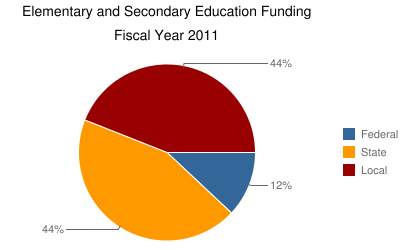 The issues of the school-to-prison pipeline in relation to school funding is two-pronged then; the methods through which the majority of school funding is received work against high-need, high-risk areas that already have limited community resources, and the allocation of funding to rapidly growing prisons instead of schools. A re-examination of funding priorities and methods may go a long way in alleviating one aspect of the school-to-prison pipeline and resource inequality for students from kindergarten onward.